Sitting down in the yellow "taksi" at Istanbul's Ataturk Airport and seeing the welcoming grin of the unshaven driver who greeted me with "Merhaba" (hello), I just blurted out, "Çok güzel." I forgot I remembered the phrase. It just came to me — like a baby shouts for joy. I was back and it was "beautiful" indeed. I went through a decade-long period of annual visits, but it's been years since I wished a Turk "merhaba," that local aloha or namaste. My first hours in Turkey were filled with déjà vu moments like no travel homecoming I've ever had. 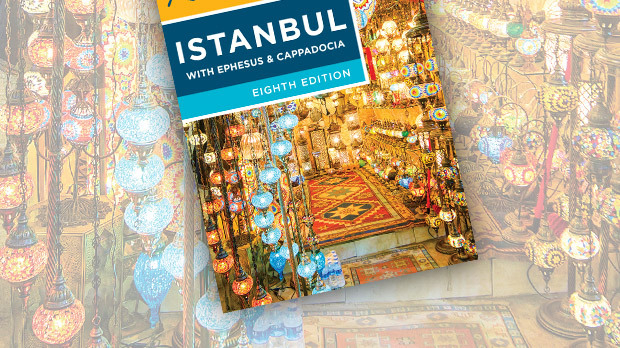 While Turkey's new affluence has killed the dolmus, the echoes of the boys hollering from the vans bounced happily all around me: "Aksaray, Aksaray, Aksaray…Sultanahmet, Sultanahmet, Sultanahmet." My favorite call was for the train station's neighborhood: "Sirkeci, Sirkeci, Sirkeci." As most tourists do, I visited the famous mosque. Stepping out of my shoes and into the vast turquoise (a color early French travelers took home — as the "color of the Turks") interior of the not-quite-rightly-named Blue Mosque, something was missing. Yes…gone was the smell of so many sweaty socks, knees, palms and foreheads soaked into the ancient carpet upon which worshippers did their quite physical (as Muhammad intended) prayer workouts. 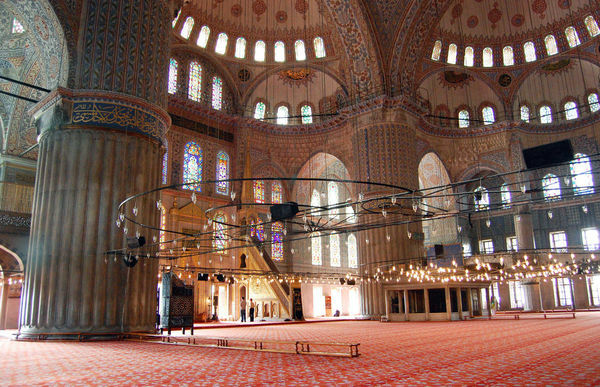 Sure enough, the Blue Mosque has a fresh new carpet — with a subtle design that keeps worshippers organized like lined paper tames letters. Prayer let out and a crush of locals headed out the door. The only way to get any personal space was to look up. And that breathtaking scene played again for me — hard-pumping seagulls powering through the humid air in a black sky coming into the light as they cross in front of floodlit minarets. Walking down to Istanbul's churning waterfront along the bay called the Golden Horn, I missed the old Galata Bridge — so rusted with life's struggles. But the vivid street life — boys casting their lines, old men sucking on water pipes, sesame rings filling cloudy glass carts — has retaken the new bridge. And on the sloppy adjacent harborfront, the venerable "fish and bread boats" were still rocking in the constant churn of the busy harbor. In a humbler day, they were 20-foot-long open dinghies — rough boats with battered car tires for fenders — with open fires grilling fish literally fresh off the boat. For a few coins they'd bury a big white fillet in a hunk of white bread and wrap it in newsprint and I was on my way…dining out on fish. In Turkey, I have more personal rituals than in other countries. I cap my days with a bowl of sütlaç. That's rice pudding with a sprinkle of cinnamon — still served in a square and shiny stainless-steel bowl with a matching spoon not much bigger than a gelato sampler. And I challenge a local to a game of backgammon — still a feature in restaurants, teahouses, and cafés. Boards no longer smell of tobacco, with the softer wood inlays worn deeper than the hard wood. And now the dice are plastic, with obedient dots rather than the tiny handmade "bones" of the 20th century, with dots that didn't line up. When I spun the dice and paused…a bystander moved for me. As before, if you don't move immediately, locals move for you. There's one right way…and everybody knows it. Today in Turkey the people, like those dots, line up better. There's a seat for everyone as public transit is no longer so "stuffed." Fez sales to tourists are way down, but scarf wear by local girls is way up. There's a rigidity to the chaos and each of my déjà vu moments shows a society that stays the same, while enduring great change.